In our globalising world, can we talk of a 'common law or ius commune of human rights'? Is such a common law being developed by our judges in conversation with judges from foreign jurisdictions and from the European Court of Human Rights? Can this be the new natural law? These and other questions are addressed in this volume through the experiences of England, France, Germany, Russia, Scotland, Turkey, the Commonwealth and South Africa, and the European Court of Justice and the European Court of Human Rights. This volume also looks at why and how far judges are employing the comparative approach, the legitimacy of this approach, and the question of whether comparativism is an interpretative aid, 'functional' or 'ornamental'. Invaluable for comparative lawyers, comparative constitutional lawyers, human rights lawyers, law students and lawyers engaged in transnational issues in the area of human rights, this book addresses issues such as defining where 'globalism' ends and 'localism' begins, and whether there is a place for 'cultural exceptionalism' in the context of human rights. It gives an excellent insight into comparative law in the context of human rights. It gives an excellent insight info comparative law as a pool of models, the workings of legal tranpositions and the role of judges. 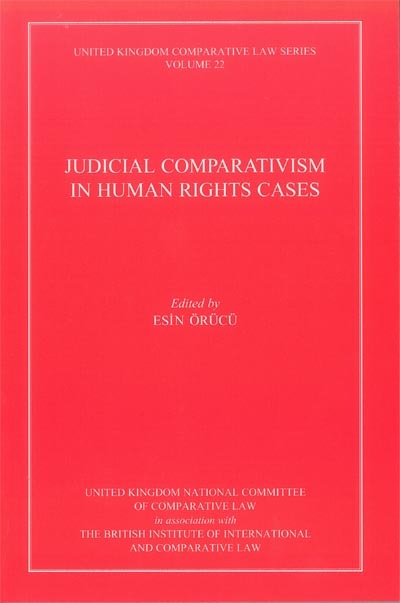 "Judicial Comparativism in Human Rights Cases"